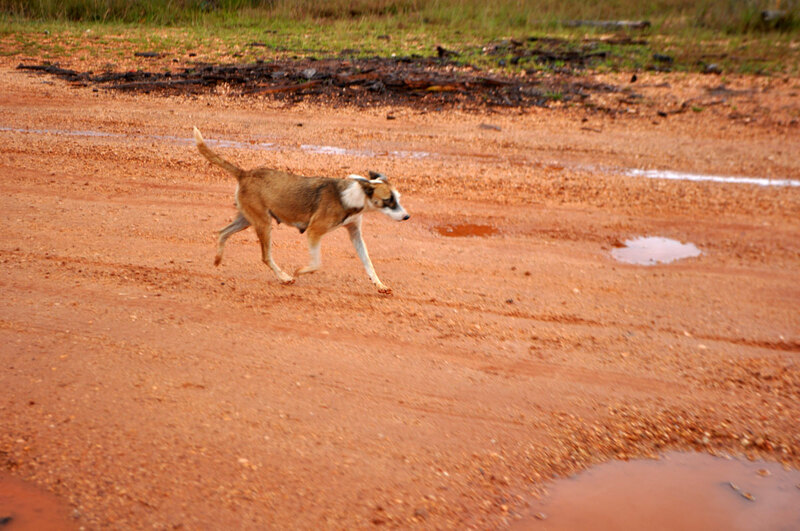 Dog chases our bus on the highway to Santa Marta. SANTA MARTA - We were thankful for the rain. Without it we would have been forced to choose between the dust or the heat on the small Toyota bus as we made our way to Santa Marta. In Puerto Cabezas, none of the available charter buses have air conditioning and opening the windows would have normally resulted in us choking from the dust rising up from the dirt highway. The rain meant there was no dust, but it didn’t mean we would be spared the potholes which rattled us for almost two hours on our 60 kilometre journey. The bus itself was a hodge podge of seating cobbled together from other vehicles. The bench at the back of the bus was particularly stiff, sending us slipping both up and down and left and right as the driver swerved to miss the worst of the indentations on the road. The highway turns into a dirt road before you even emerge from Puerto Cabezas, the landscape softly rolling before emerging onto a flat plain where the trees become fewer in number. You can count on one hand the number of vehicles we pass going in the opposite direction, most comprising of motorcycles or trucks. At the first village we encounter a rope across the road just before a wooden bridge fording a river. A soldier asks us the purpose of our visit given we are about to enter an area that is controlled by Misk'tu indigenous peoples. As we arrive a short while later at Santa Marta’s school we can hear singing from the nearby church. It’s Sunday, and we’ve arrived during a time of worship in a deeply religious community. 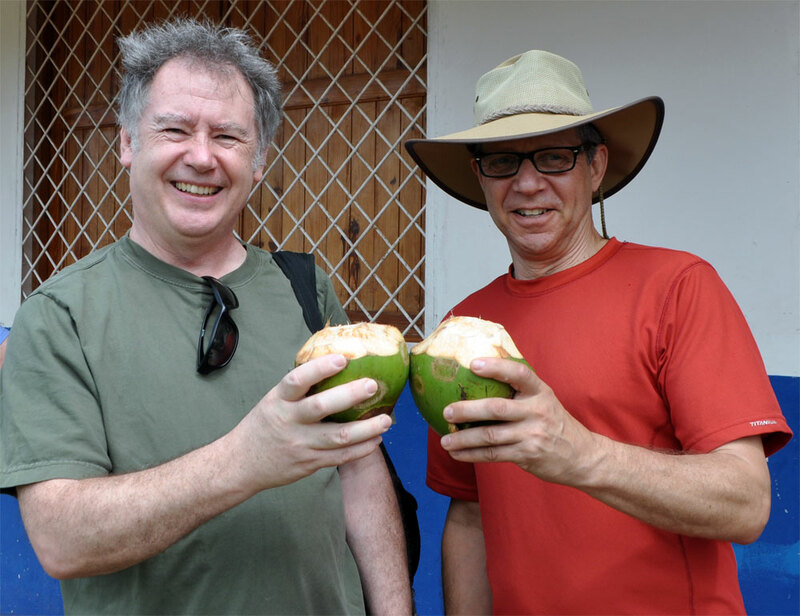 OPSEU’s Rick Janson and Jeff Arbus toast with coconuts. 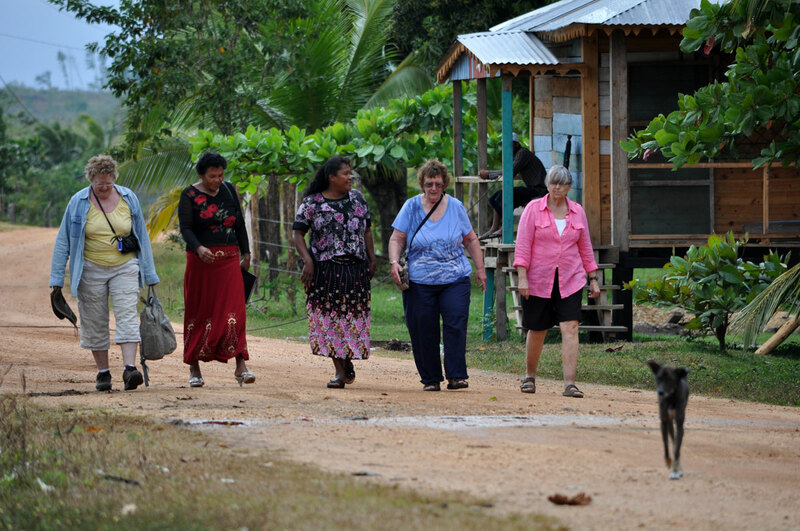 It is therefore surprising to see about a dozen community leaders waiting for us. School desks are set up in a sheltered area between two buildings where a gentle cooling breeze exists. Before we have a chance to sit down, a man with a machete is cutting open a hole in the top of green coconuts for us to drink from. When the drink is done, we return and he cuts the coconut in half and makes cutlery from a piece of shell so that you can scoop out the creamy sweet coconut lining inside. The faded signs of international aid agencies appear next to an infrastructure that has clearly run down. 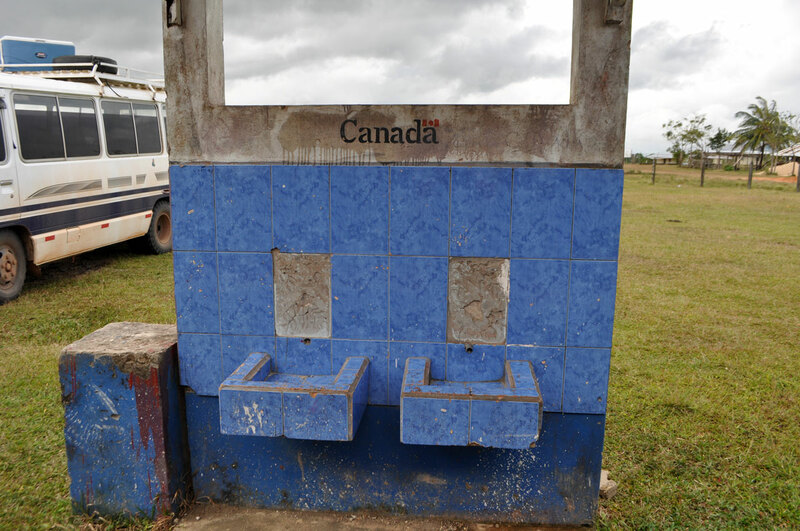 There is a Canada sign on a pair of water fountains that no longer work. It reminds us that one-time development is seldom sustainable. The project we came to hear about will likely have much more lasting effects on the community. Nicaragua is very much a patriarchal society – or as the locals will tell you, there’s a problem with machismo. Up until recently the local women tell us that they thought it was their role to simply do what the men tell them to do. 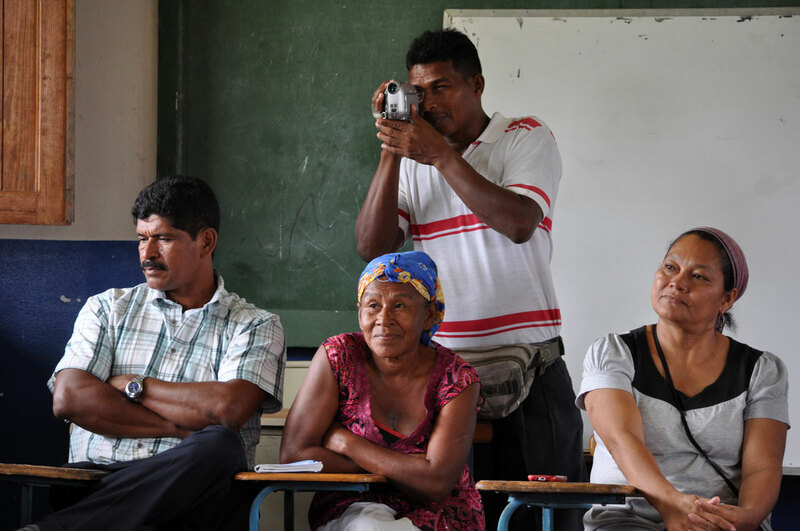 The laws in Nicaragua are changing that, but a law is not social change by itself. Groups like AMICA – with support from Cobourg Ontario’s Horizons of Friendship – are looking to breathe life into these laws, educating women in communities like this. They are told they do have rights and are equal to men. That work includes training community “judges” to interpret the new laws. These Misk'tu judges are elected by the surrounding communities in a show of hands. Their initial term is for one year, and if they do a good job, can serve a second year. There is no pay for what they do – this is strictly voluntary. Signs of past development that has run down. Each community elects a judge and a back-up judge should the first not be able to fill their duties at any one time. They are part police (they can handcuff a suspect), part social worker, and part mediator in disputes. Disputes can involve anything from the ownership of a pig to sexual abuse. After being elected, the Nicaraguan authorities are notified that this person now is acting on behalf of the community. Eventually the meeting in Santa Marta moves inside after the rain starts blowing into the shelter. Introductions are made, sometimes having to translate three ways from Misk'tu to Spanish to English. As women become aware of their rights, one judge says it has caused a degree of conflict within his community. Some men have felt isolated by this new solidarity among women, and ironically it has led to the kind of related violence the new laws were intended to overcome. Several spoke of the importance of educating the men along with the women. Another judge said that while the work is focussed on women, they want to make sure that the men understand. She said that she is undertaking to educate her own husband. A videographer gathers material for the local news channel. A woman judge said she had just been appointed in January. She held up a black book which serves as her case file. Getting the information around these cases is an important part of the work. These case files are in turn shared with AMICA and the Nicaraguan authorities and can be an important part of the judicial process. One of the requirements to be a judge is an ability to read and write. Enforcing the new laws, she has been personally attacked 14 times. In Nicaragua getting attacked often means with a machete. She says before AMICA came to her village she had no idea about gender equality. Now she firmly believes in her mission and is resolved not to be intimidated. The judges are also supported by the community, including a growing number of women who want to be part of these changes. Most women we met feel the new laws are making major improvements in their daily lives and asked Horizons not to abandon the education project. They say they have seen the results. A judge removed a 14-year old girl from an abusive relationship with her family, sending her out of the community for protection and treatment. The parents initially refused to let her take the child, later threatening the judge. Today the child is studying in the Bluefields Indian Caribbean University at Puerto Cabezas and is doing well. The parents are now proud of their daughter, but realize their actions were inappropriate. They have asked the community for forgiveness. Walking together to lunch after the meeting. The work AMICA and Horizons is doing also builds self-esteem. We were told that in one village women seldom raised their heads, keeping their eyes to the ground. All that has changed with new recognition of their rights. Work in the community extends beyond the issue of violence. AMICA has been active in educating women about their personal health. Santa Marta and the surrounding communities have had an epidemic of uterine and breast cancer. They are encouraging women to be tested in the local health clinic. The community members said they were amazed that we came from so far away to see them. One woman said it meant we must have “big hearts, pure hearts.” Some dressed their children in their best clothes to see us. After the meeting we walked down the street to the home of one of the AMICA women who served up a traditional Nicaraguan feast. 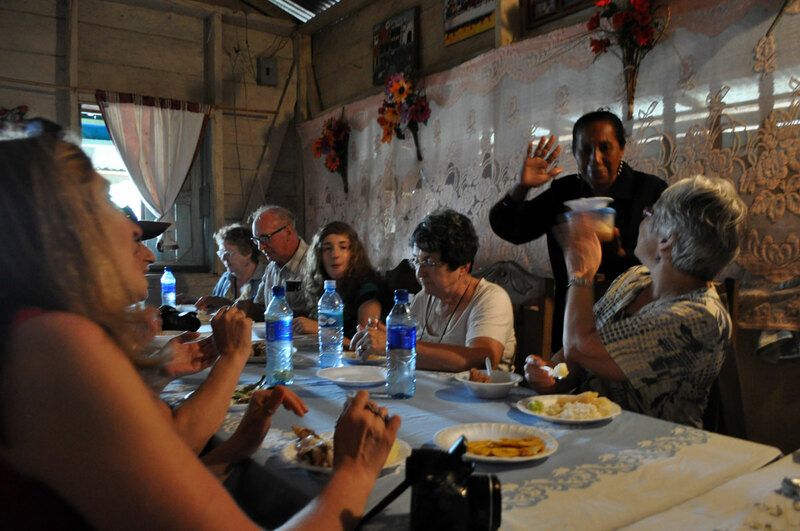 A Nicaraguan feast in a Santa Marta home. Driving back along the bumpy highway we passed back through the first village on our travels. A baseball game was taking place, but all eyes turned to our bus as we made our way back to Puerto Cabezas. AMICA is bringing about social change at incredible speed. Like the highway, there will be some bumps along the road, but their commitment suggests the journey will be worth it.